PlanSwift is an on-screen digitizing and takeoff system that is suitable for both commercial and residential GCs and subcontractors in a number of industries, such as electrical, heavy/highway, plumbing, and custom and production home builders. 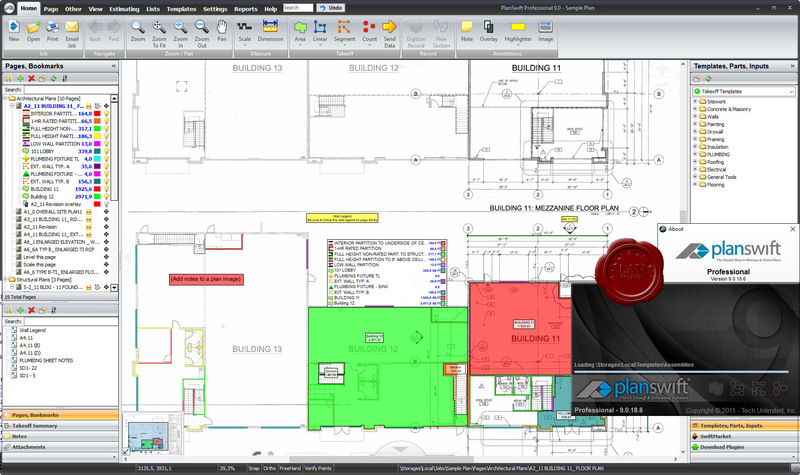 The solution's functionality can be applied to most businesses that utilize digital blueprints. PlanSwift provides a way for users to calculate digitized values, including labor and material costs, by clicking various points on the screen. The Single Click feature allows users to measure linear and square footage with one mouse click. The program also includes 64-bit Microsoft Excel integration and a browsing feature that lets users create and find new jobs in any location on the network or desktop, improving collaboration between team members. Takeoff features of the system include drag-and-drop assemblies on items, the ability to add hyperlinks, and automatic prompts that give users hints on what to do next during the process.